From the September 19, 2012, One of Margaret River's most popular beachfront properties takes on a new, global name. Quay West Resort Bunker Bay in Western Australia's Margaret River wine region will rebrand to Pullman Resort Bunker Bay. From the September 19, 2012, one of Margaret River’s most popular beachfront properties takes on a new, global name. Quay West Resort Bunker Bay in Western Australia’s Margaret River wine region will rebrand to Pullman Resort Bunker Bay. As the first Pullman hotel to be launched in the State, it is part of a rapid expansion plan for Accor’s 5-star Pullman brand across Australia, Asia and the rest of the world. The first Pullman property for Western Australia, Margaret River’s Quay West Bunker Bay will take the Pullman name. Accor acquired the Pullman name in 1991, and at the time a number of hotels – including the famed Metropole Hotel in Hanoi – operated as Pullman hotels. Accor re-launched the brand in 2007 and the brand has now established a network of over 60 hotels in many of the world’s key cities (London, Paris, Dubai, Bangkok, Shanghai, Sydney, Auckland) and favourite resort destinations (Cannes, Bali. Phuket, Cairns and now Bunker Bay). General manager of the Resort, Bronwyn Bulpitt, said the international branding would benefit the whole region, with Accor’s global sales, marketing and distribution set to showcase the region in many of Australia’s key inbound markets. “The resort has really established itself as one of Western Australia’s leading resorts in its eight years of operation, and with Pullman branding I think we can take the resort to new levels,” said Bulpitt. Pullman Resort Bunker Bay, Margaret River Region offers 150 bungalow-style villas with a choice of studio, one, two and three-bedroom configurations. All villas feature king size beds, well-equipped kitchenettes, opulent bathrooms, and wireless internet. The resort also has six state-of-the-art meeting rooms and a permanent marquee which can hold up to 400 people, making it an ideal setting for weddings and gala events. The variable conference and meeting rooms which can for up to 180 people have an abundance of natural light with picturesque views over Bunker Bay. Contemporary dining at Other Side of the Moon restaurant is a highlight, while other resort facilities include a 24-hour reception desk, room service, concierge and tour desk, four tennis courts, an outdoor heated wet edge swimming pool and gymnasium. With wineries such as Moss Wood, Leeuwin Estate and Lamonts nearby, as well as whale watching, caving, Cape Naturaliste Lighthouse and Busselton Jetty within a short distance, Pullman Resort Bunker Bay is in an ideal position to indulge in spoils of the Margaret River region. 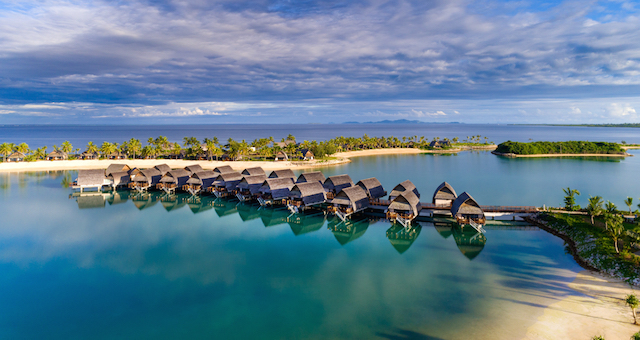 The brand new resort is the only property on Fiji's mainland to offer overwater villas.